Intraocular Lens Implantation - Comparative Biosciences, Inc.
and final appearance of successfully implanted IOL. An intraocular lens implant is a synthetic, artificial lens placed inside the eye that replaces the focusing power of a natural lens that is surgically removed, usually as part of cataract surgery. 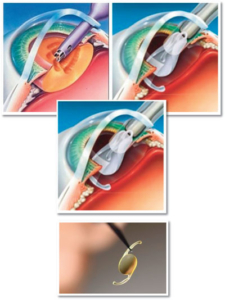 CBI provides a range of sophisticated and customized intraocular implant models. We are offering intraocular lens implantation surgery for cataract treatment particularly in both pigmented and albino rabbits. Our DACVO board-certified ocular surgeons are skilled in IOL surgery which includes lens extraction (phako-emulsion) and then insertion of the artificial lens into the lens capsular bag. Some of our studies require the insertion of other or second devices, for example, devices that elaborate intraocular drugs such as beta blockers, anti-hypertensives, antibiotics, or anti-inflammatories. Specialized ocular surgical equipment at CBI include motor-driven surgical microscope, phakoemulsion device, and microinstruments. We have state-of-the-art post-surgical care and sophisticated post-surgical in life assessments including slit lamp examination, funduscopy, IOP determinations, pachymetry, fluorescent cornea and retinal examination, photography, as well as ocular histopathology and immunohistochemistry. Contact Comparative Biosciences, Inc. to discuss a scientific study program for Intraocular Lens Implants Models, Disease Studies and Services.